The International AIDS Society had migrated to Office 365, but did not have the flexibility to manage corporate email signatures across the entire organization and on different web domains. Exclaimer Cloud - Signatures for Office 365 allowed the organization’s ICT department to deploy a uniform Office 365 signature with official corporate branding. It also processed signatures based on a user’s primary SMTP address, making it perfect for the various domains owned by the IAS. The International AIDS Society (IAS) was founded on 12 June 1988 and is the world’s largest association of HIV/AIDS professionals. Over 16,000 members from some 196 countries actively work together to tackle the global AIDS crisis through medical treatment, community action, investment in HIV cure research and dedicated initiatives for key populations at a higher risk of catching the HIV virus. Since 2012, the IAS has been in consultative status with the Economic and Social Council, the United Nations central platform for reflection, debate and innovative thinking on sustainable development. Currently, the IAS organizes two of the most prestigious HIV conferences in the world, the Internal AIDS Conference and the IAS Conference on HIV Science. By convening the world’s largest meetings on HIV/AIDS, the IAS provides critical platforms for presenting new research and sharing best practices in the fight against AIDS. Through the work that it carries out, the ISA plans to reduce the global impact of AIDS and protect future generations from this terrible disease. Too many companies often let their employees create their own corporate email signatures, without any thought as to how these designs might appear to others. It might look interesting to create a signature with fancy animations and colorful fonts, but these are not appropriate for any organization that want to convey a professional brand image. It is interesting how email signatures are still perceived to be of low value. Even though email is one of the primary forms of business communications, employees often do not realize that all corporate email reflects an organization’s ‘tone’ just as much as letterheads, business cards etc. Therefore, the stronger an email signature is, the more value it adds to a brand. Being the focal point of a major medical initiative such as helping to eradicate AIDS means the IAS has a global reputation to uphold. 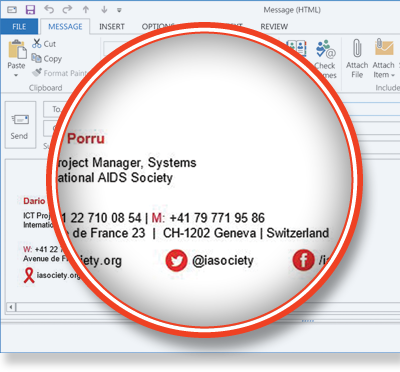 Having recently migrated to Office 365, it was decided that the organization needed a way to put a standard and centralized email signature in place for all staff based on the main organizational web domain (iasociety.org). At the same time, separate designs were to be utilized for specific conference-based domains such as Aids2016.org. In the past, and somewhat inevitably, some IAS users would modify the signature templates they were given, while others would not implement them correctly. Thousands of emails are sent by the organization every day, so having control of the email signature channel was imperative from a branding and compliance perspective. In order to set up an Office 365 signature, an IT administrator has to create a Transport Rule that will apply it to all users. The more variations of a signature you have, the more rules you have to create. Conducting email signature management in this fashion comes with a number of restrictions and can prove to be very time-consuming. This was the problem that the IAS faced as it prepared for the task of deploying specific signature variations across multiple domains. A simple online search brought him to the Exclaimer website where he found details of its Office 365 signature service, Exclaimer Cloud - Signatures for Office 365. He discovered it would be able to add HTML email signatures to all messages sent from Office 365. There would be nothing to install and no additional upfront maintenance on IT infrastructure required. It would also mean that IAS users would get the correct signature even if they were emailing from a mobile device or Mac, with the added bonus that no one would be able to modify their signature. “As we had already signed off the signature blocks we wanted to use, but had no effective way to deploy them, choosing Exclaimer Cloud - Signatures for Office 365 was an easy choice to make,” said Mr Porru. The Exclaimer sales team stayed in constant contact to provide additional assistance, which impressed Mr Porru, appreciating the after sales support. As the IAS is a not-for-profit organization, special pricing was given and an extensive trial period offered. The required email signature templates were also rebuilt and imported into the Exclaimer Cloud - Signatures for Office 365 UI.